It feels wrong not to mention it. The loss that is sweeping the nation, and maybe even the world. I’m sad to hear that Robin Williams is gone, that he took his own life, and that we grieve the loss of one of the greats. I’m sad, too, that this icky darkness called depression continues to prevail. I know it’s a serious something; more complex that intense sadness, or loss, or a phase. It takes people down a trickling path that fades to nothing and I am sad. As someone who has depression running through my family, this loss makes me even more aware of the pervasive nature of this deep disease that can sink into us. I just want to say we will miss you. And to all of those out there who are struggling with out fortune or fame, we care about you too. This news is making me appreciate the little things and encouraging me to create some excitement within my own day. Its the sweet moment of Dylan doing the dishes while I write (hallelujah), or the after work bike ride as we race just to be silly. It’s chocolate covered pretzels and budget meals of “fried rice” with eggs and peas and chicken because we try to save some dough. It’s the feeling that maybe we are more than just a spec on the planet, that our interactions mean something and have greater force than what we can even imagine. We each matter. We each ripple into one another’s lives and thoughts, and patterns and rituals. Who are you letting ripple into your own? 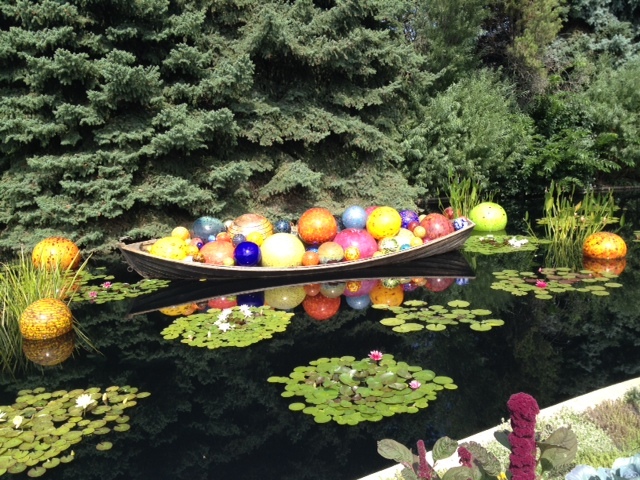 This weekend we took a much needed break and went down to the Botanical Gardens in Denver to see the glass exhibition by artist Dale Chihuly. Even though we could have been making schedules and checking lists and being productive I forced Dylan to wake up early so we could check something off of my summer bucket list. At the gardens I took a picture of what appears to be his mission statement, and it drew me right in. Simplicity in a set of circumstances. Circumstances that appear to be dark and hot and uncomfortable. Circumstances that shape and contort and form one substance into something greater, bigger, more beautiful than it’s original form. I guess the image of refining under fire is not a new one. We burn away the chaff, ask for God to grant us refiners fire, or purify our selves in the form of a golden phoenix. This extended metaphor in this man’s work got me thinking though, and I was so appreciative for the beautiful pieces of work he creates. Delightful and fun and playful these pieces are. You want to reach out and touch them, taste them to see if the vibrant colors remain as sweet as they appear. They are tactile, and have movement, and give room to interact – which I tend to think provides the best artistic experience. Both the art and the viewer get to have a relationship in interpretation. I think that’s neat. I wished the instillations allowed for you to walk through them, like the works of Jean Claude and Christo. Maybe Dale doesn’t trust us viewers with such fragile pieces of work – I guess I wouldn’t either. 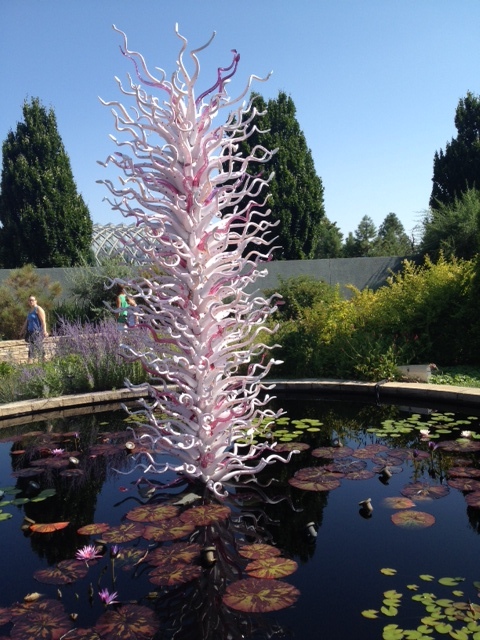 Glass is much more delicate than fabric. 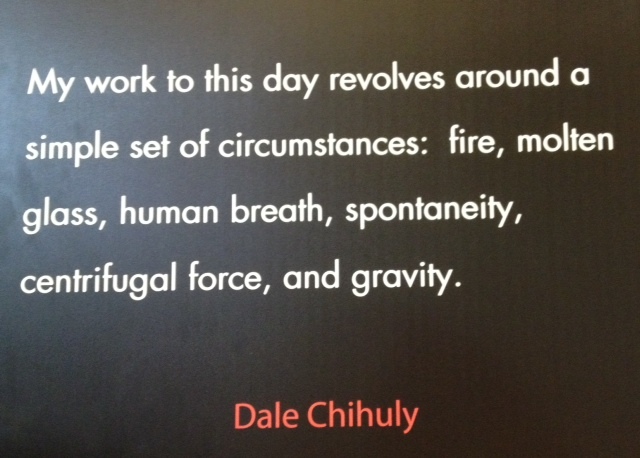 It seems, at times, that sets of circumstances in all of our lives are out of control, frustrating, unmanageable. Dale got me thinking, however, maybe they are all just simple, and if we let other forces bigger than us have a hand in creating who we are meant to be, we can come into our own form of beauty, as eccentric as that may be. What forces are at play in your life? Are there simple moments you are thankful for today? 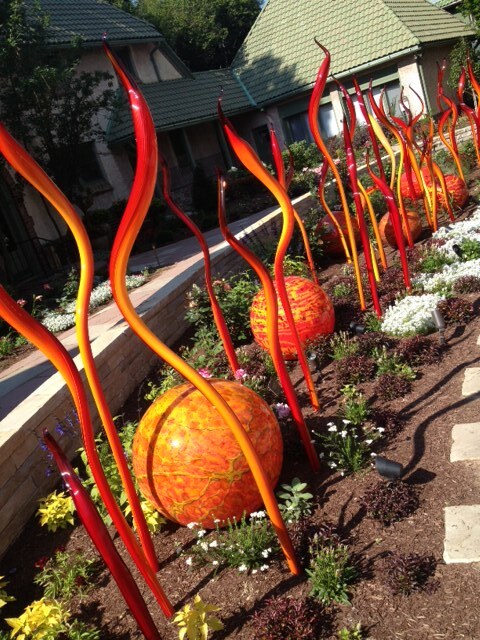 *All works shown done by Dale Chihuly – pictures taken by me.